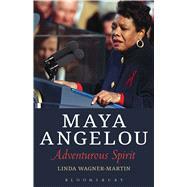 A comprehensive biographical and critical reading of the works of American poet and memoirist Maya Angelou (1928-2014). Linda Wagner-Martin covers all six of Angelou's autobiographies, as well as her essay and poetry collections, while also exploring Angelou's life as an African American in the United States, her career as stage and film performer, her thoughtful participation in the Civil Rights actions of the 1960s, and her travels abroad in Egypt, Africa, and Europe. In her discussion of Angelou's methods of writing her stunning autobiography, which began with the 1970 publication of I Know Why the Caged Bird Sings, Wagner-Martin writes about the influences of the Harlem Writers Group (led by James Baldwin, Paule Marshall, and John O. Killens) as well as Angelou's significant friendships with Malcolm X, Martin Luther King, Jr., and other leaders from both international and African American United States cultures. Crucial concepts throughout include the role of oral traditions, of song and dance, of the spiritualism of art based on religious belief, of Angelou's voiced rhythms and her polished use of dialogue to convey more abstract “meaning.” Wagner-Martin shows that, viewing herself as a global citizen, Angelou never lost her spirit of adventure and discovery as well as her ability to overcome. Linda Wagner-Martin is Hanes Professor of English and Comparative Literature at The University of North Carolina at Chapel Hill, USA. She was the 2011 recipient of the Hubbell Medal for lifetime service in American literature (sponsored by the MLA), and has received the Guggenheim fellowship, the senior National Endowment for the Humanities fellowship, the Bunting Institute fellowship, and awards from the Rockefeller Foundation, the American Philosophical Association and others. She has published more than fifty-five books of criticism, some edited, including Sylvia Plath: A Biography (1987), Sylvia Plath: A Literary Life (second edition 2003), and Toni Morrison and the Maternal (2014).